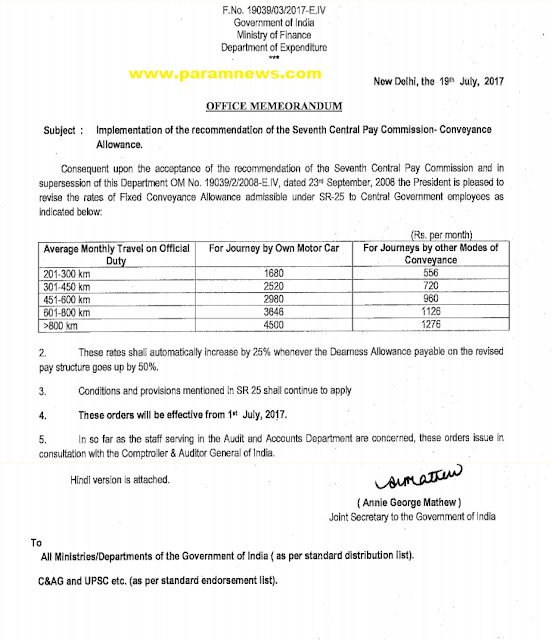 These rates shall automatically increase by 25% whenever the Dearness Allowance payable on the revised pay structure goes up by 50%. 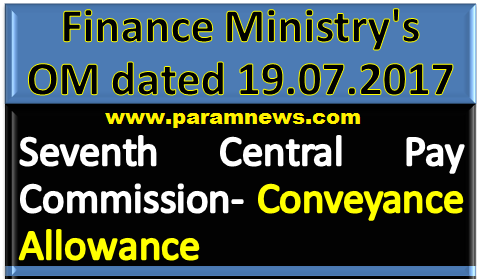 New Delhi, 19 July 2017: Ministry of Finance, Department of Expenditure has issued Office Memorandum on 19th July regarding Implementation of the recommendation of the Seventh Central Pay Commission- Conveyance Allowance. Conditions and provisions mentioned in SR 25 shall continue to apply. These orders will be effective from 1st July, 2017. In so far as the staff serving in the. Audit and Accounts Department are concerned, these orders issue in consultation with the Comptroller & Auditor General of India. 7th CPC: Conveyance Allowance - Finance Ministry's OM dated 19.07.2017, These rates shall automatically increase by 25% whenever the Dearness Allowance payable on the revised pay structure goes up by 50%. Conditions and provisions mentioned in SR 25 shall continue to apply. These orders will be effective from 1st July, 2017.